Buckle up for a wild ride with Zac Efron and Robert De Niro in DIRTY GRANDPA with this all-new poster. 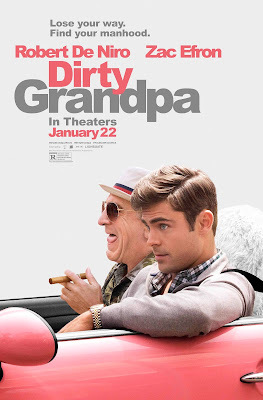 From director Dan Mazer (Borat, Ali G) and writer John Phillips (Bad Santa 2), comes DIRTY GRANDPA. Efron and De Niro star alongside Aubrey Plaza, Zoey Deutch, Julianne Hough, Jason Mantzoukas and Adam Pally in the outlandish comedy about a straight-laced lawyer (Efron) duped into driving his foul-mouthed grandfather (De Niro) to Daytona for spring break. Hit the road for the ultimate bro-trip, rolling into theaters January 22! This outlandish comedy also stars Julianne Hough, Aubrey Plaza, Dermot Mulroney and Adam Pally.